Bev had already had a previous facelift when she contacted my office. 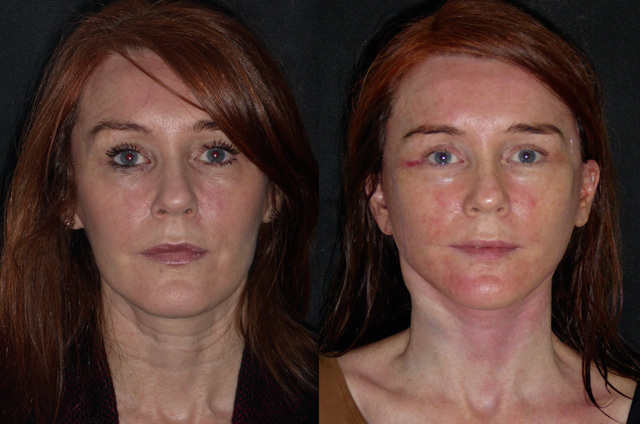 She had tried a facelift under local and sedation with another surgeon but felt that her result hadn’t had the desired effect for longer than a few months. 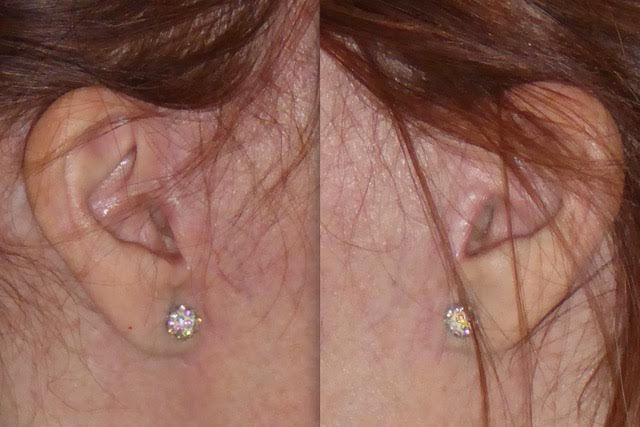 Examination of her scar line showed me that nothing had been done to her neck which is what bothered her most. 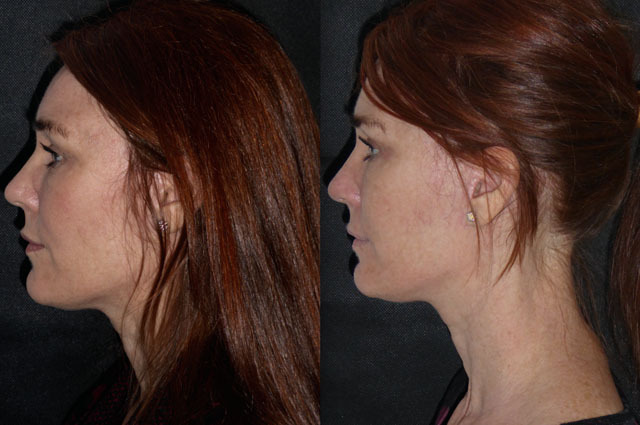 She had a lot of soft tissue laxity considering she had already had facial surgery so I felt that I could help her achieve what she was looking for with a revision face and neck lift. 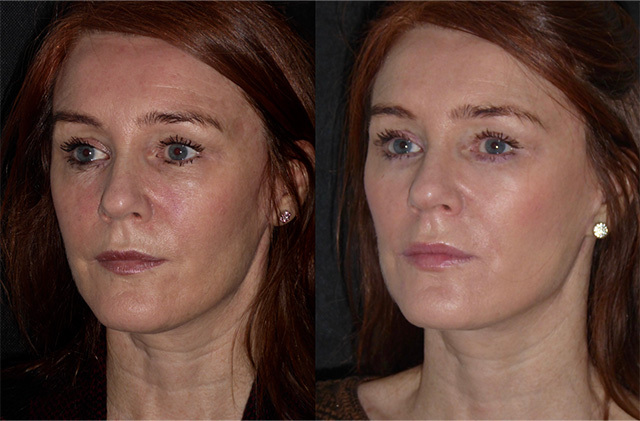 I also lifted the lateral third of her brow to globally rejuvenate her face. Here is her story. Yesterdays surgery explained a lot. 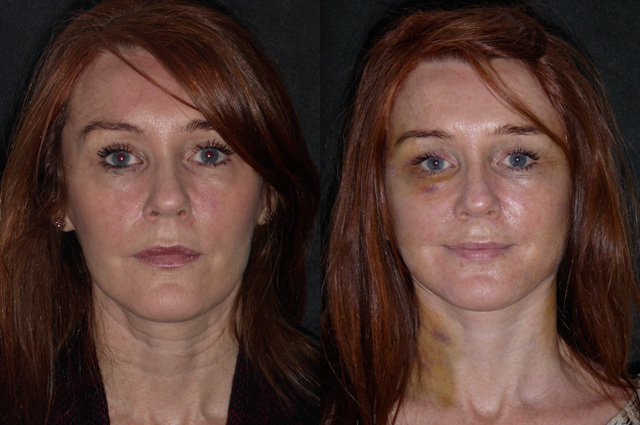 Her previous facelift was a skin only lift, there was no evidence of any work to the underlying SMAS or facial musculature. 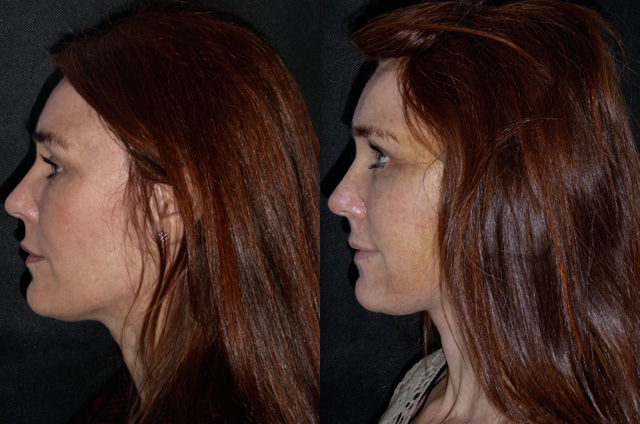 Skin lifts are short lived and went out in the 1970’s. 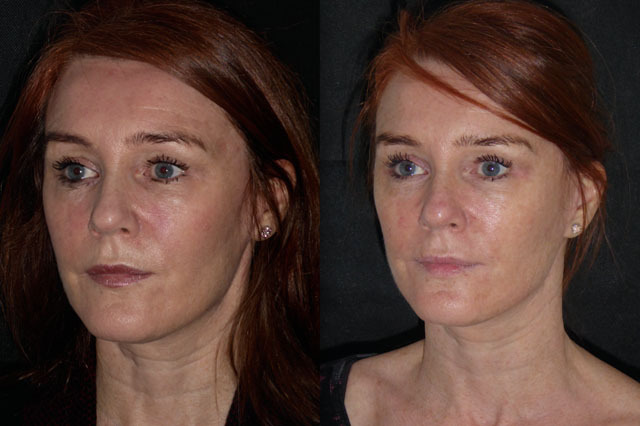 In my opinion any facelift that takes less than 2 hours can’t do the job properly, or if it does then corners have been cut. Exactly why I don’t operate a conveyor belt practice with operating lists 4 or 5 patients long. I couldn’t give everything to the face in front of me if I was racing against the clock! Bev is looking swollen but should have a lovely result. 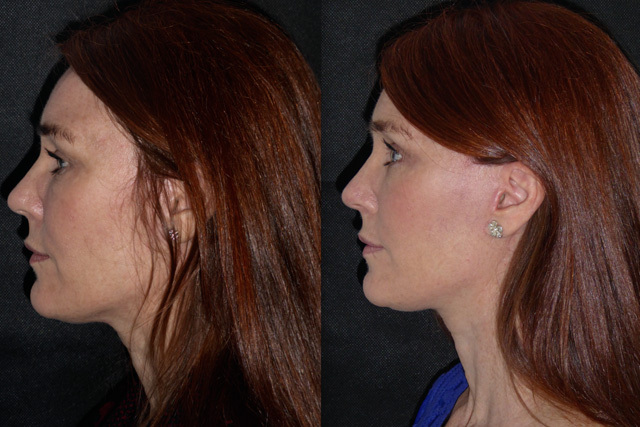 The face “feels” much tighter than last time and it is harder to fully open her mouth. All normal and will ease up over the next few days. Bev is back, bruised but looking brilliant. 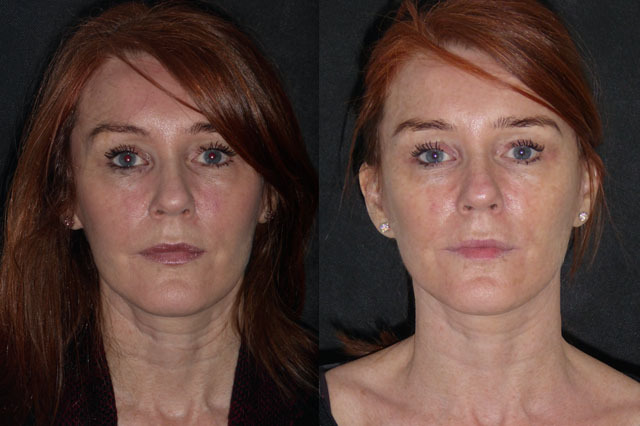 Her neck skin excess has improved and her mid face has been revolumised which freshens the lower eyelids too. Poor Bev has a whopper of a bruise on the right eye from her brow lift component and the nerve to her right forehead muscle is a little sleepy from swelling meaning the brow has lost its natural curve. This will come back but can take up to 3 months. 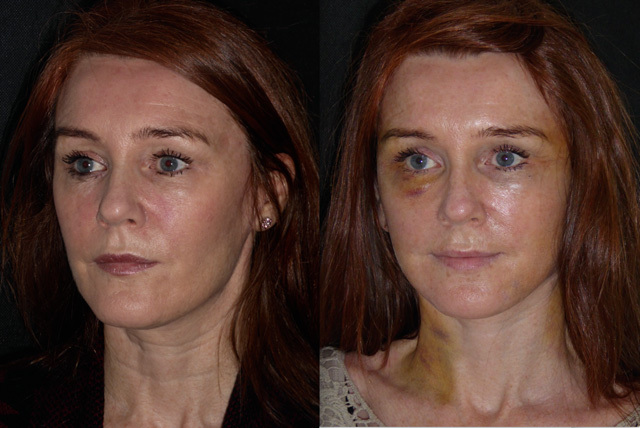 The beauty of local anaesthetic is during surgery I asked Bev to move each area of the face after I had finished dissection. This means I absolutely know the nerve hasn’t been cut but has gone into temporary hibernation. WOW! Bev is back for her month review. She looks stunning and far far younger than her actual age. 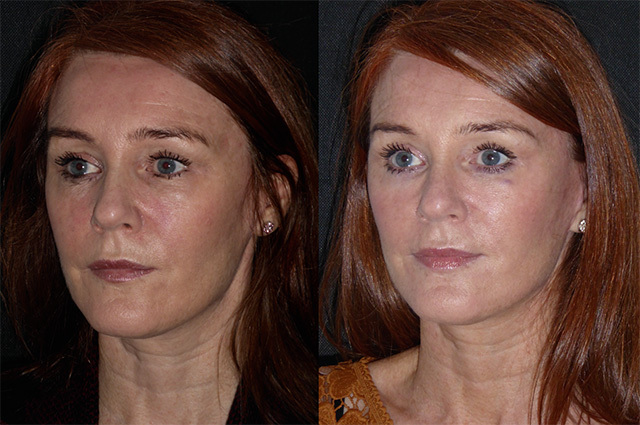 Lovely volume in the mid face and cheeks supports her previous lower eye hollowing (although should would now like me to address the fat pads and crepey skin!) and her neck and jawlines are perfect. She still has a little swelling under the chin which should improve with a few more weeks. Her scars are already almost invisible as we can see from her profile picture with her hair tucked behind the ear. 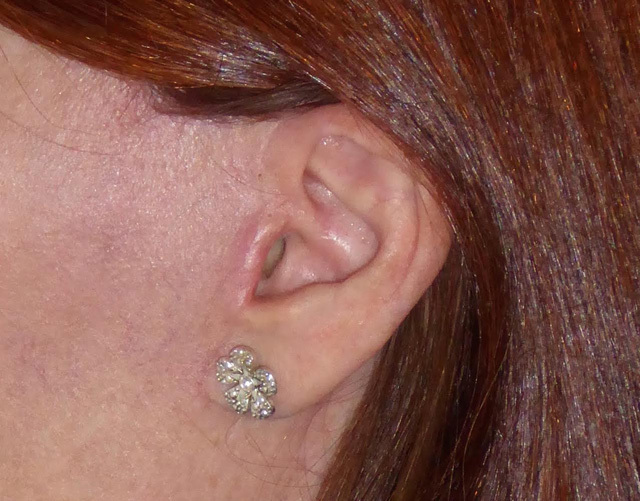 Careful placement of an incision which meanders around the ear contours, meticulous closure and diligent aftercare usually results in really acceptable scarring. 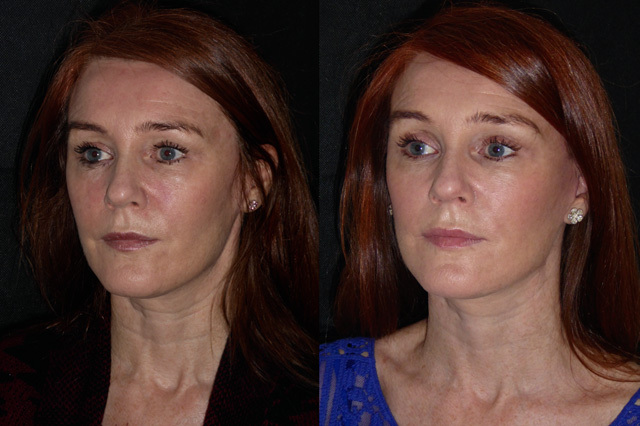 Today Bev has come back at 4 months for transconjunctival lower eyelid blepharoplasty, skin pinch and C02 laser. 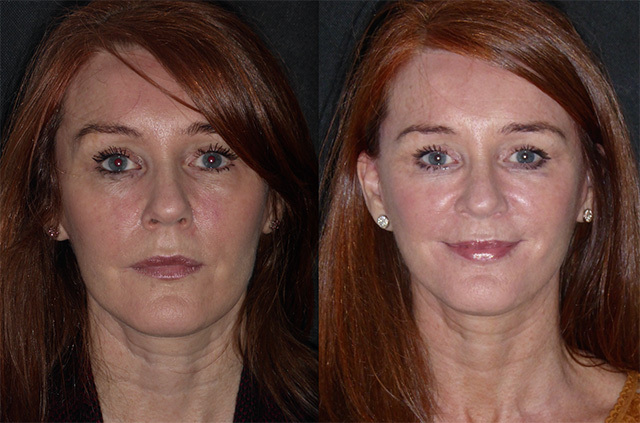 Her facelift looks great but she would like the lower eyelid fullness and skin addressed. It is a good opportunity to see how her lift is holding up. She continues to do well, is healing fantastically and there is very little relaxation. For a woman the other side of 50, she looks incredible. I have attached a close up picture again of her scars which are really really difficult to see even with clinical lighting and magnified loupes. 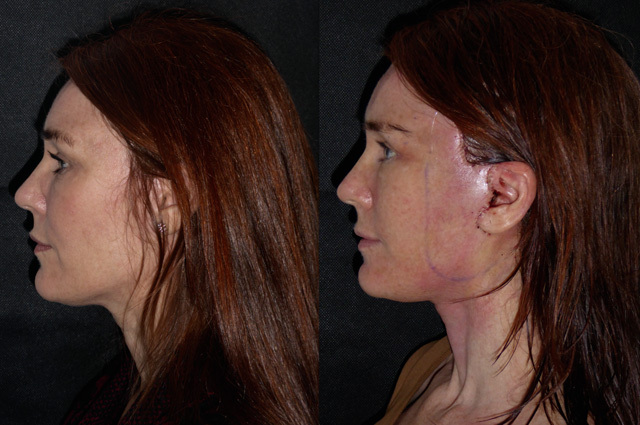 She does have a few thread veins (telangiectasia) under the skin so I have lasered these. Bev is back to see me a year after her surgery. A year older but a decade younger looking in these photos. Is this lady really the other side of 50?! 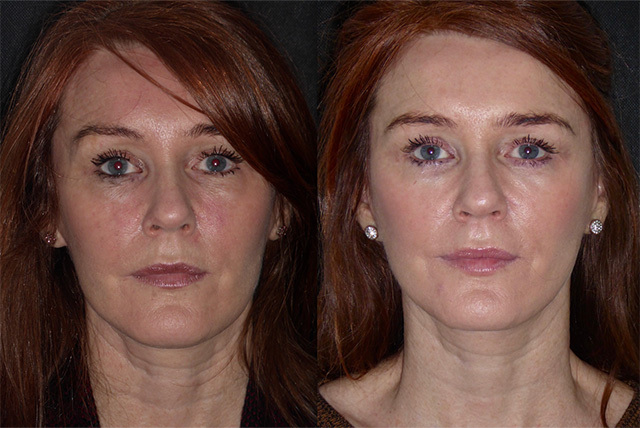 Her lower eyelid surgery performed a few months ago has healed really well and will continue to evolve. 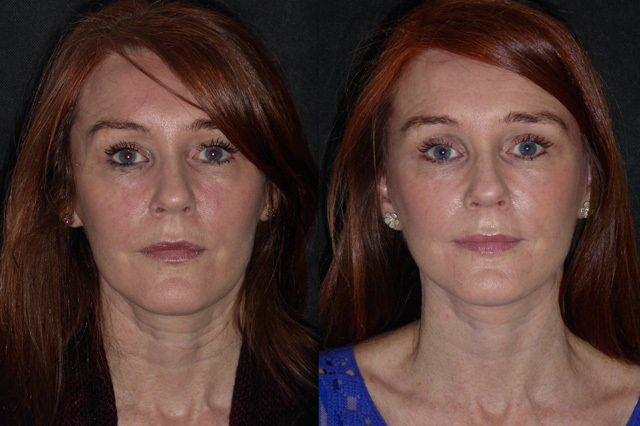 A beautiful fresh face, full of vitality and happiness which suits Bev perfectly. 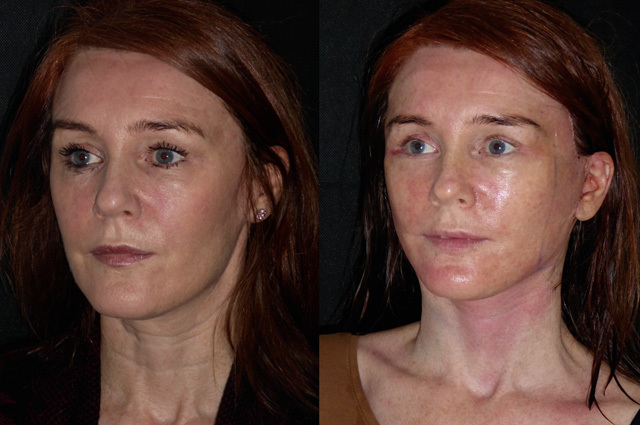 We are now going to address her skin to really maximise her result. Bev is recently came back to see me about her underchin fullness. 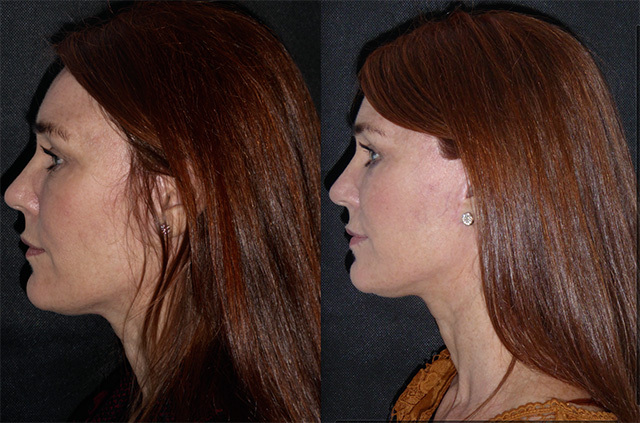 A little pocket of fat and lax platysma muscle was creating a small pouch. 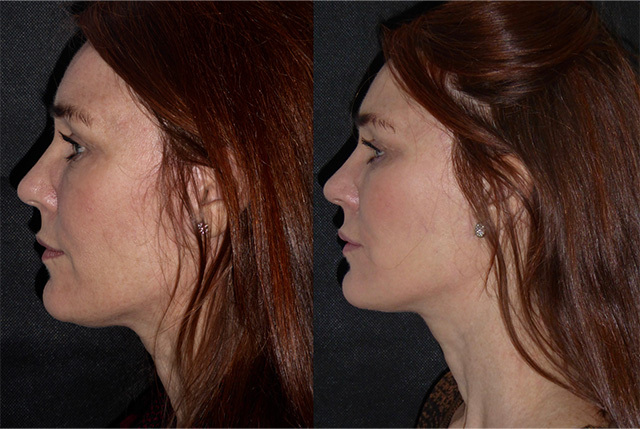 I performed a platysmaplasty and liposculpture to get her the more defined profile she sought with a lovely result.